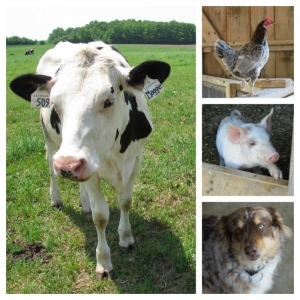 At the farm, manure and urine from the cows ends up in the fields through one of two processes. 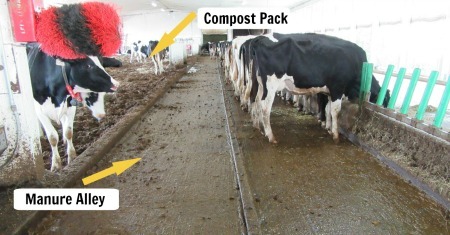 About 40% of the manure and urine lands in the manure alley that is between the feed gate and the compost pack. It is a cement floored area, and a metal bar on a track moves back and forth clearing the excrement and directing it to a drain. Approximately twice a year we hire a manure spreading business to come in with their trucks to spread the manure. Almost always our liquid manure is spread on our hay fields after the first or second cut. Most recently, it took 3 tankers about 6 hours to clean out our tank. We contract this work out because otherwise we would need to purchase and maintain our own tanker. The contractors are quick and efficient, and maintain their own equipment. 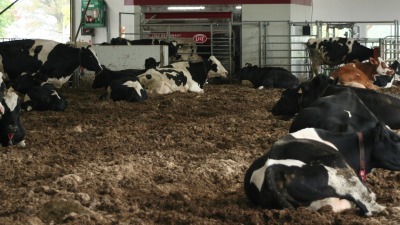 This manure and urine mix includes higher levels of methane and ammonia, whose gasses give it a strong smell. 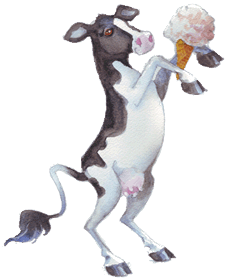 Because of the higher levels of methane and ammonia it can be unhealthy for the soil depending on how it is applied. It is important for it to be applied at a low rate to the soil, and applying it to the hay field means there are existing plants there to help process it. It does offer lots of positives as well. It is a good source of nitrogen, contains lots of potash, some phospherous and other micronutrients. All of these are essential to plant growth. If we were to apply it to a non-hay field, our next choice would be a field ready to be plowed. We would apply it and then mix it into the soil through plowing. 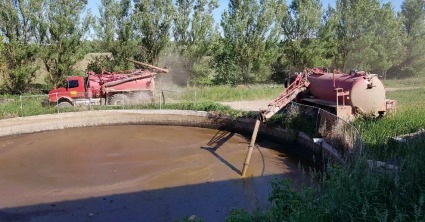 In Europe it is more common to use equipment that injects the liquid manure into the soil. This is not common here in Canada. Where does the other 60% of the manure and urine go? It is captured in the compost pack where it is eaten by bacteria. Because the methane and ammonia are absorbed the compost pack is quite smell free.